Club Penguin Cheats by Mimo777 Club Penguin Cheats by Mimo777: Club Penguin Igloo Decorating Contest! Club Penguin has a new Igloo Decorating Contest... the Tropical Igloo Contest. 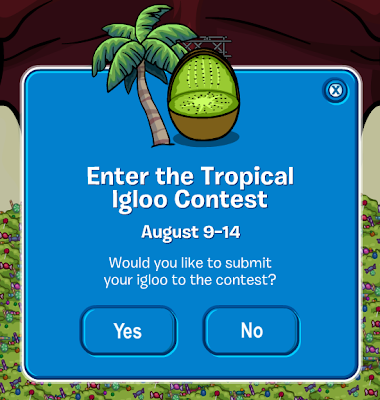 Once you get your iggy all tropically awesome and what not, click the submit button in the bottom right of your igloo. Then click "Yes!" It's that easy! Dunno, my iggy is really "sweet" right now. Do you think I can make it fruity, too? 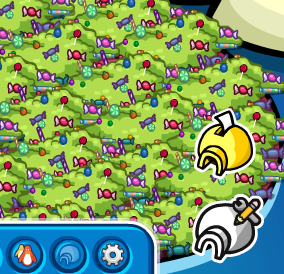 I can't wait to hear how you decorated your igloo for this contest! If you need more deets about this contest, check here.